A contract killer with a tragic past trains a teenage girl to avenge the murder of her family and falls for her in the process. A son reunites his widowed father to the long lost lover of the latter and urges him to marry. 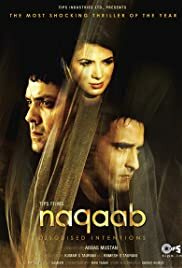 Right before watching Naqaab I understood that if I have ever to catch this Abbas-Mustan thriller that would be only for newly introduced Urvashi Sharma. Beside this I find no other reasons to watch. Every time I see Urvashi I remember of Diana Rigg, the Bond girl of 1969's On Her Majesty's Secret Service opposite George Lazenby. She is new but surprisingly she did help to flash the camera as a new battery. Although the movie was made colourfully it hardly puts any positive colour to our heart, due to such an over-twisting plot. This is the third nonsense directorial presentation from director duo Abbas-Mustan after Daraar and Badshah. After watching a single time I got fed up with the movie and hope not to repeat it watching again. So far they have used Bobby Deol with better prospects in their previous thrillers - Soldier, Ajnabee and Humraaz, but here they all put him under the mud. Although his role has a bit tragedy here but it fails to load back in memory after the movie reaches its end. But the romantic humours between Akshaya and Urvashi are really hilarious and worth watching. Quiet something they can form a good pair if mechanized correctly. I had to say once again if there is any reason to watch Naqaab, that is Urvashi Sharma. She performed her first role with full confident, and I noticed nothing weaknesses in her acting as well as screen-presence. I beg to Abbas-Mustan to cast her in future again in their next upcoming projects with good story, casting and production.